Ready.Set.READ! (RSR) is a community-wide initiative managed by United Way of Berks County, which focuses on early grade reading success because it is a critical component of learning and a leading indicator of future academic and educational success. With 43% of Berks County third graders reading below grade level, many of our children are four times more likely to drop out of school and 13 times more likely to drop out if they live in poverty. With statistics like these, RSR works hard to ensure reading proficiency for students by the end of third grade. A major strategy of the initiative is the Star Readers tutoring program. 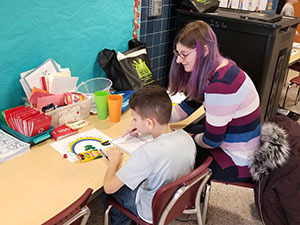 Star Readers is RSR’s largest program with over 400 volunteers providing tutoring assistance to struggling second and third grade readers within 29 schools in Berks County. Ready.Set.READ! Director Cindy Line agreed. “The Brandywine Heights Area School District has been offering tutoring for first graders for years, and there has been great value in the program.” It was becoming evident that second grade may be too late to begin focusing on reading skills because, “reading skills begin at birth; the earlier we train a child, the better and more prepared they will be to learn to read,“ Line said. 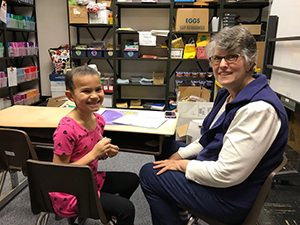 Vicki Pinkard is a tutor to both second and first grade students. Vicki enjoys being a tutor because she is passionate about reading and knows how important literacy is to young children. She understands the importance of introducing tutoring at a younger age and she is already seeing the rewards of her work. “I see a big difference each week I tutor the first graders,“ she said. As the program continues to grow, so does the hope that Ready.Set.READ! will be able to ensure more Berks County students attain reading proficiency by the end of third grade. If interested in volunteering to be a Star Readers tutor please contact Darby Wiekrykas at Darbyw@uwberks.org or by phone (610)- 685-4574.